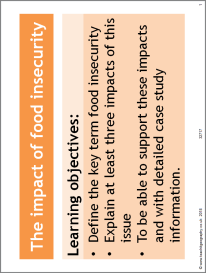 This resource focuses on different reasons for food insecurity. Students create a mind map showing these different impacts and identifying examples of each. A six mark example examination question and mark scheme are included.